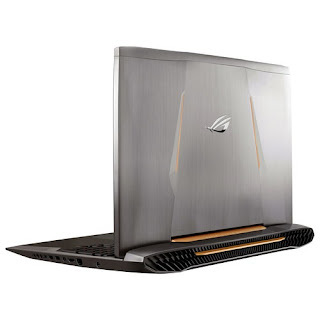 The ASUS ROG G752VTDH72 is a powerful laptop PC comes packed with the processing power of 6th Generation Intel Core i7-6700HQ quad - core processor based on the Skylake architecture that features 6 MB level 3 cache and runs at the base clock speed of 2.6 GHz with Turbo Boost up to 3.5 GHz. This laptop PC comes with a dedicated graphics controller dubbed NVIDIA GTX 970M graphics which is powered by 3 GB dedicated video memory and capable of rendering high definition movies and playing latest games with ease. 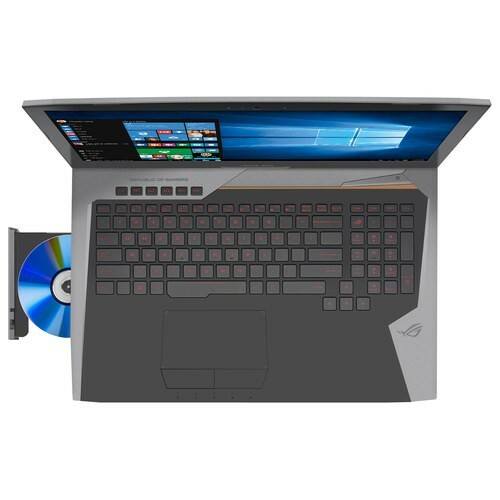 The ASUS ROG G752VTDH72 laptop is equipped with 16 GB system memory for intense multitasking and gaming; 1TB hard drive and 128 GB solid state drive (SSD); Nahimic Sonic Suite 2 features Sonic Studio and Sonic Radar speakers; built-in media reader for simple photo transfer that supports SD and MMC memory card format; built-in webcam with microphone; Blu-ray Disc burner for high-def movies; LED-backlit keyboard for fast typing in dim lighting; and Lithium-ion battery which will give you several hours of working away from the main source of electricity. Moreover, this ASUS ROG G752VTDH72 laptop PC is packed with the following display features like 17.3" Full HD display that features NVIDIA G-SYNC display technology and 1920 x 1080 resolution. The resolution in this laptop PC is quite high so it is expected that the display in this laptop is sharp and clear compared to laptop PCs with lower resolution. It comes in copper silver finish for stylish look. With regards to connectivity, this ASUS ROG G752VTDH72 laptop PC is equipped with Bluetooth interface syncs with compatible devices; Next-generation wireless connectivity; 4 USB 3.0 ports and 1 USB 3.1 Type-C port maximize the latest high-speed devices; and Thunderbolt port for connecting advanced monitors and external drives. 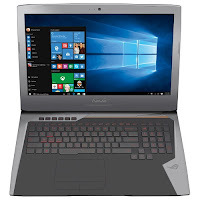 The ASUS ROG G752VTDH72 laptop PC is powered by Microsoft Windows 10 operating system. It measures around 1.9 inch x 16.4 inches x 12.7 inches and weighs about 9.5 pounds. You can have this computing device at the price of $ 1799. Other device in this price range includes MSI GS60 GHOST-PRO 4K-605.